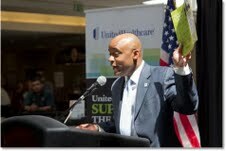 UnitedHealthcare, in partnership with the YMCA, The Center for African American Health, American Diabetes Association (ADA) and Albertsons pharmacies, is bringing the proven Diabetes Prevention and Control Alliance (DPCA) programs to facilities in Denver and the surrounding communities. The DPCA is a clinically proven community-based initiative aimed at tackling the epidemic of type 2 diabetes and pre-diabetes. It includes the Diabetes Prevention Program, a lifestyle coaching program that shows those with pre-diabetes how to eat healthier and increase their physical activity to keep from developing type 2 diabetes. It is estimated that one in three Coloradans have pre-diabetes. The Colorado Department of Public Health and Environment has been working with health plans, community groups and other partners across Colorado to support the Diabetes Prevention Program with coordination and training. CDPHE Executive Director Chris Urbina spoke about diabetes health consequences and prevention strategies at a May 14 press conference announcing United Health Care's new initiative.